Bearberry is a small evergreen shrub often used as a groundcover. It is an excellent choice to provide winter interest with the tiny leaves that turn bronze in the fall, and the small red berries that last until spring. Bearberry is also useful for drought and salt-tolerant landscapes. Arctostaphylos uva-ursi is the botanical name and it belongs to the Ericaceae (heather) family. 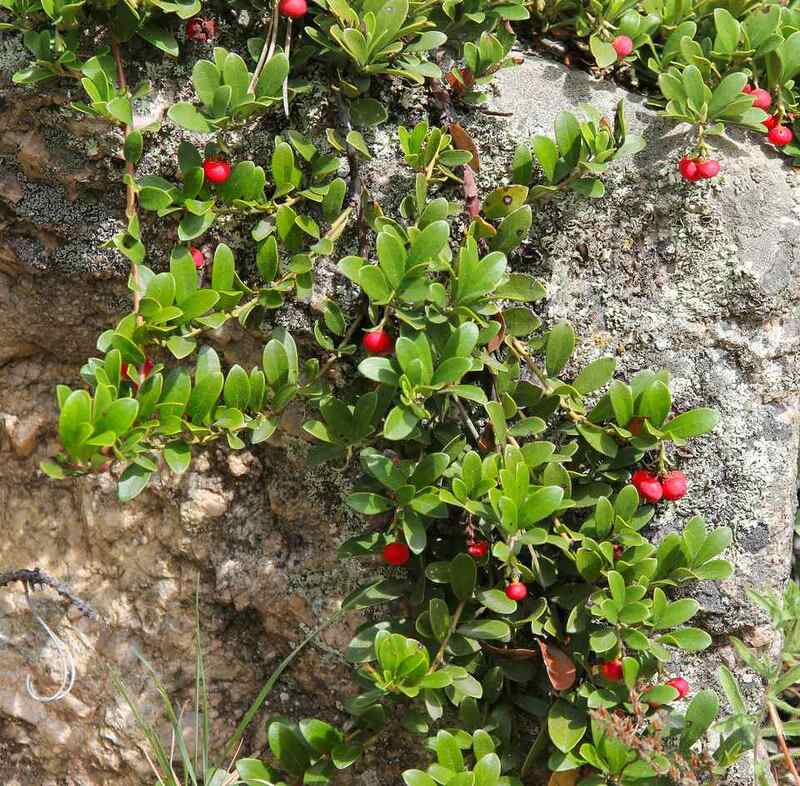 Names used for this shrub are bearberry, kinnikinick, mealberry, sandberry, kinnikinnick, and hog cranberry. Zones 2-6 are suitable for growing this plant. Bearberry grows 6-12" tall and can grow 3-15' wide. The shape is a dense mat. Full sun is best, though it can tolerate light shade. Leaves are .5-1" long and .25-.5" wide, turning bronze in the fall. Flowers are small, bell-shaped in white or pink, appearing in April or May. Fruit is .25" red berries that last from fall until the next spring. This is a good choice for a ground cover. Evergreen leaves and red berries add winter interest and attract wildlife. It has peeling, red bark, another point in its favor as a winter interest shrub. It is salt-tolerant, so it can be used in gardens near the coast and in cold urban areas where the roads are salted. It can be used to attract hummingbirds. This is good for use in drought-tolerant landscapes. Bearberry is sometimes difficult to transplant and become established and is a slow grower. Prefers well-drained acidic sandy soils. It can live in poor soils. Propagation is through stem cuttings or seeds that have been sacrificed and stratified. It may develop winter burn. Leaf spots may develop if the plant is stressed. Bearberry is used in alternative medicine to treat bladder problems like a UTI, notes our Alternative Medicine expert, Cathy Wong. It can also be used for an itchy scalp according to Gerrie Summers, our Multicultural Beauty expert. Note: The preceding section is for educational purposes only and should not be taken as medical advice. Check with your health professional before taking bearberry for medicinal reasons.